Did you know that the military’s estimates provided to Truman for American losses in an anticipated invasion of Japan in 1945 were exceptionally low? When President Harry Truman wrestled with the decision to drop the atomic bomb on Japan in late July 1945, a significant factor in his thinking was the projected cost of invading Japan’s home islands. The U.S. military had provided several estimates, all of which were high. But in the 1960s a group of revisionist historians claimed that compared to the devastation of the bomb, they justified invading as the preferred option. These claims were based on a very early casualty estimate given to Truman of a “low” of 100,000 killed or wounded and a “high” of 500,000 casualties. When told of these estimates, General Dwight D. Eisenhower, the Supreme Allied Commander in Europe, though it “a tremendous error in calculation.” He, of course, had just invaded Normandy a year earlier. What is missed in this early estimate is that the projected losses continued to rise all summer. General George Marshall met with President Truman on June 18, 1945, and used a phrase that misled non-military historians when he referred to a casualty table from invasions of Leyte, Luzon, Iwo Jima, Okinawa and Normandy. He said that the first month of an invasion in Japan would likely look very much like Luzon’s casualties. But he was referring to a ratio of American to Japanese killed, not total numbers. Worse, Marshall’s estimates of Japanese on Kyushu were low. More recently, several American and Japanese sources have produced a much different picture of Japanese troop numbers on the home islands. D. M. Giangreco, for example, found that while planners estimated some 350,000 Japanese troops would be on the island, in fact there were at least 430,000. Richard Frank, researching Japanese archives, found at least two more divisions had been moved in from China of which the U.S. planners were unaware. This was in line with the estimates of a June 1945 study given to Secretary of War Henry Stimson of 1.7 million to four million U.S. casualties (with between 400,000 and 800,000 dead) and Japanese losses of five to ten million killed. Moreover, as Maddox pointed out, American casualty estimates provided to Truman initially were only the ground forces and did not include ships lost to kamikazes, aircraft lost, accidental deaths (which always were considerable in wartime), or sickness and disease. Giangreco also discovered plans by Japanese to flood the plains where the U.S. expected to build airstrips, leaving the Americans fighting in “terrain similar to that later encountered in Vietnam.” No bridges existed capable of taking a vehicle of more than 12 tons, requiring U.S. engineers to build every new river crossing they encountered. Japanese historian Sadao Asada offered another perspective from inside Japanese archives, noting that only the bomb brought the warlords to discuss surrender. “There is nothing we can do about the ... atomic bomb,” they said. 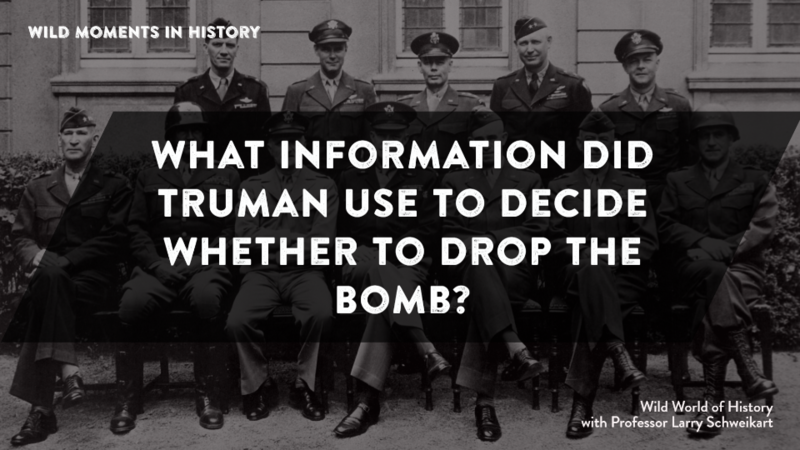 Truman was fully justified in dropping both bombs. Since the Japanese did not surrender immediately, the most immoral thing in the world would have been to drop one bomb, and then, because it didn't achieve surrender, having to invade to force a surrender.